"This truth is not only a daily experience of faith, but recapitulates the heart of the mystery of the Church. In different ways of experiencing the joy of the Church, the constant fulfillment of the promise:" And here I am with you always, even unto the end of the world "(Mt 28:20). 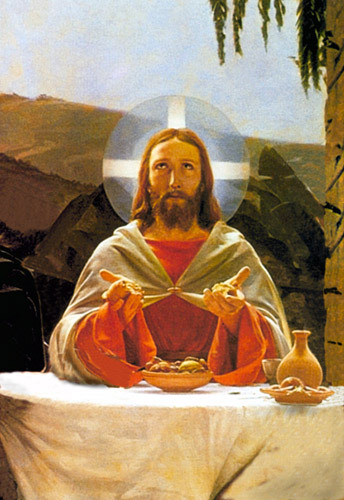 The Holy Eucharist, the changing of bread and wine into the Body and Blood of the Lord, she rejoices in this presence with unique intensity. From the day of Pentecost, the Church, the People of the New Covenant, began her pilgrim journey towards her heavenly homeland, Blessed Sacrament has the rhythm of her days, filling them with confident hope. " John Paul II, Encyclical "Ecclesia de Eucharistia"
History of the Most Blessed Sacrament Parish. 16 June 1987 - organized the parish is Fr. Can. Eugene Grabowski. The site designated for the construction of the temple is a wooden cross - the symbol of Christ's presence on the estate. August 8, 1987 on - Fr. Can. Eugene Grabowski shall be nominated as pastor of the parish. Start of the life of the Church of Christ in the new parish is building settlements is still young. Masses are celebrated "open air" at a makeshift altar, both on Sundays and weekdays. From 1 September 1987 . in areas generated in the basement of a neighboring parish plot begins catechesis for children and adolescents. April 1988 .- Square is temporary, covered the altar at which Bishop Lepa Adam give the Sacrament of Confirmation of the first in the history of the parish youth group. In the square there are benches for the faithful. The construction of a temporary chapel. As the first two rooms are being constructed. March 1989 - already under roof, the faithful are going through a period of the Easter Triduum and the Easter Resurrection. In May 1989, the largest group of children - over 230 - accede to the First Holy Communion. September 1990, Archbishop Dr Wladyslaw Ziolek celebrating a solemn Mass Chapel made ​​sacrifices. In 1992 - Bishop Adam Lepa gives a first in history, the canonical visitation of the Parish. May 1993 - after receiving permission by Fr. Can. Eugene Grabowski started the construction of the temple. In 1995 - Archbishop Dr Wladyslaw Ziolek during the solemn Mass of laying the foundation act made ​​and erected the walls of the Temple sacrifice. May 1997 . - Holy Missions led by Pauline prior to the dedication of the Church. At the church square is Cross Mission. Pauline Fathers from now on become a frequent preachers of God's word addressed to the faithful of our parishes, and traditions become Appeals Jasna Gora in Czestochowa side chapel dedicated to the Queen of Polish. pilgrimage to the homeland of Pope John Paul II, Archbishop Dr Wladyslaw Ziolek consecrated the parish church was built the Temple, "the Blessed Sacrament." In a homily addressed to the faithful, said that by the providence of God's temple is the Temple of the Pontifical. Since then, Masses. are celebrated in the new church. A celebratory mass attracted many priests above all those who worked in the parish since its erection. by Bishop Dr Adam Lepa and dedication of new organ. January 2004 . - was completed assembly of the main altar in the Presbytery of the Church. June 2004 - 50th priesthood, priest Eugene Grabowski-first pastor of the parish. The solemn Mass. attended Archbishop Dr Wladyslaw Ziolek, Metropolitan Lodz. and many priests of the Archdiocese of Lodz. August 2004 - retiring farewell to pastor Eugene Grabowski. 24 June 2007 - Jubilee 20th anniversary of the parish - a solemn Mass and dedication of the renovated church (paints, new lighting and sound design), led by Archbishop. Dr. Wladyslaw Ziolek, Metropolitan of. 23 September 2007 . - canonical visitation of the parish by His Excellency, Bishop Dr. Ireneusz Pękalski. April 27, 2009 , bearing the holy sacraments he died at 80 years of age and 55 years of priesthood, Holy Memory priest Canon Eugene Grabowski was the 1-th pastor of our parish. 1 May 2009, in the chair. 19 00 - The funeral mass for the intention of the deceased Priest of Eugene Grabowski led by Archbishop Władysław Ziolek, numerous priests and faithful, and farewell to the deceased priest. 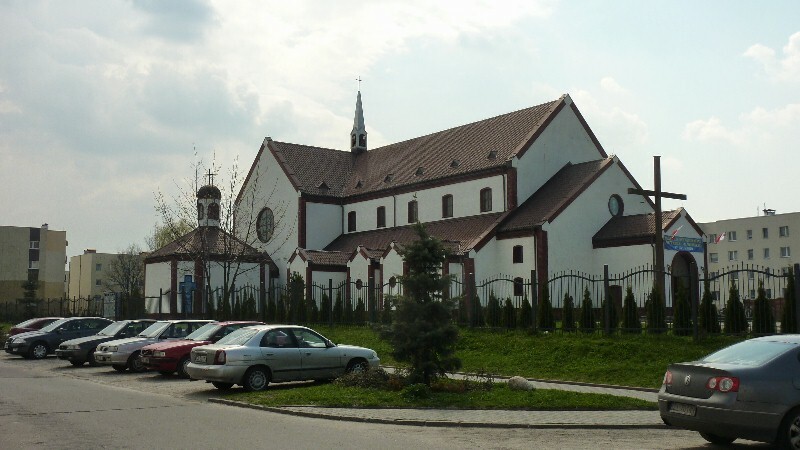 2 May 2009 - The funeral of the deceased Priest Eugene Grabowski in his home parish, Holy Trinity Jasionowka (Archdiocese of Bialystok) and burial in the local cemetery . 20 May 2009 jubilee 30 - years of priesthood Prelate Zdzislaw Banul, pastor of our parish - Mass chaired Archbishop and priests gathered Jubilations. 9 - 16 May 2010. - Parish missions before the visitation of the parish copy of the miraculous image of Our Lady of Czestochowa, led by Father Bob Waliczek OSPPE former abbot of the monastery of Jasna G�łra. May 17, 2010, hours 17.00. - The ceremonial welcome in the copy of Our Lady of Jasna Gora image arriving from the Parish of Our Lady of Consolation, by Archbishop Dr Wladyslaw Ziolek, Metropolitan of Lodz, Prelate Zdzislaw Banul pastor of our parish, pastors, priests and numerous parishioners and guests, and Mass concelebrated under the chairmanship of the Metropolitan of all-night vigil before Our ​​Lady of Jasna Gora in the image. Prayers for adults, adolescents, children, individual groups of the parish and all the parishioners until the farewell video. May 18, 2010 hours 15.30 - Solemn Mass led concelebrated by Prelate Zdzislaw Banul, pastor of our parish. Farewell and transfer the traveling copy of the image of Our Lady of Czestochowa, the parish of St. Mary Polish Queen in Lodz. May 31, 2010-Ks. Archbishop Władysław Zi�łłek grants the sacrament of the priesthood, two of our parishioners, diak.Moraczewskiemu and diak.Mikołajowi Chorzyńskiemu. 1-7 of June 2010 first masses Priest Wlodzimierza Moraczewski and Priest Nicholas Chorzyńskiego. 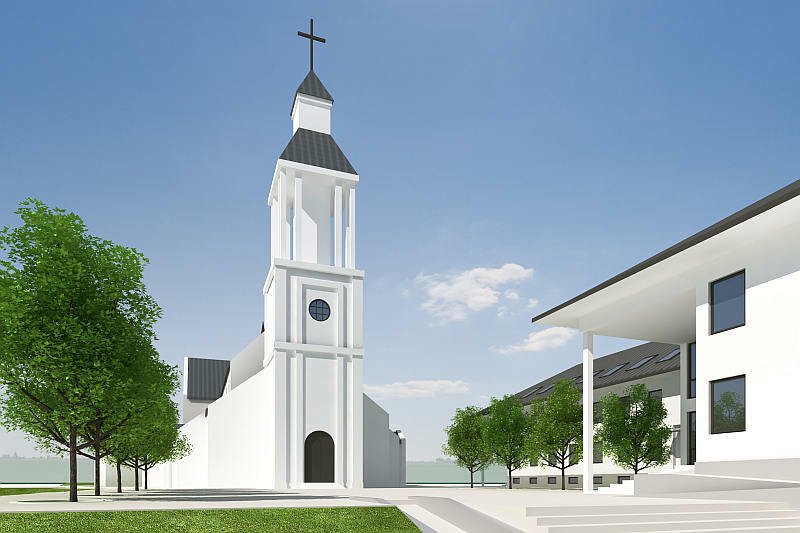 April 20, 2011-approval of new, replacement of the project construction of The Parish, made by Studio architectural ' Lipski-Wujek ' and consent to construction published by the Mayor of the city of Lodz, Hanna Zdanowską. 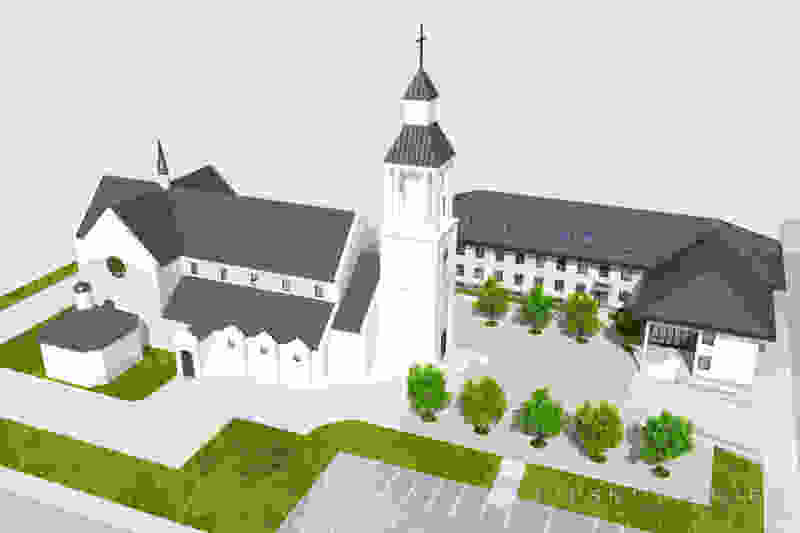 1 June 2011-starting construction of The Parish, after the confirmation of a new permit to build. 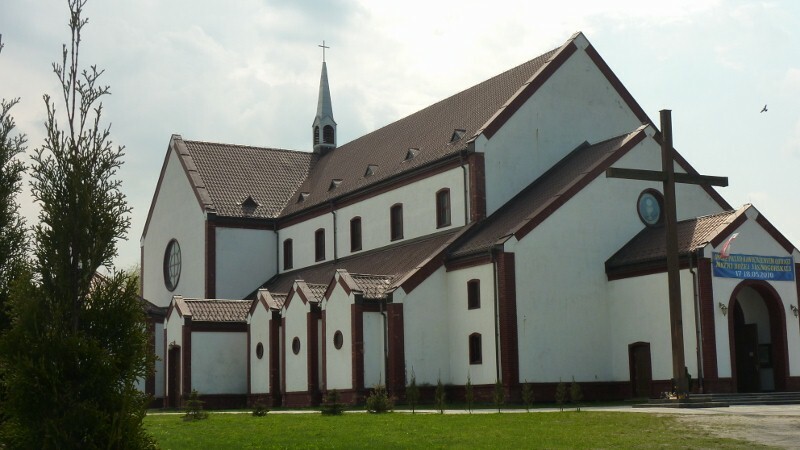 May 15, 2012-the canonical visitation parish, by His Excellency Father Archbishop Dr. Władysław Zi�łłek, Metropolitan of Lodz. 14 June 2012-25th anniversary of establishment of the parish-fr. Archbishop Władysław Zi�łłek, Metropolitan Lodz, during a solemn mass, exercised as a Thanksgiving for the vocation to life before twenty five years ago, during the historic visit of Pope John Paul II in Lodz, the parish of p.w. Najświetszego sacrament, broadcast by radio 'Niepokalan�łw ', to accumulated clergy, parishioners and guests, make a dedication and unveiling of the plaque, mentioning fact of erection of the parish, and dedicates a new streamer with the image blessed Pope John Paul II and blessed Edmund Bojanowskiego, funded by the parish community. The phone is open during business hours in the office of priest. With a note : "Building"